Turkey has played a critical role in the development of human civilization and the Jewish, Christian and Muslim faiths. While traveling through Turkey one can visit the Bursa Silk Bazaar and then take a guided tour of an Ankara Museum. This rectangular shaped country is washed on three sides by three different seas. Its shores are laced with beaches, bays, coves, ports, islands and peninsulas. Whether you travel to Turkey for the history, superb food, hand-made crafts, or simply to relax, Turkey will leave you breathless with wonder. 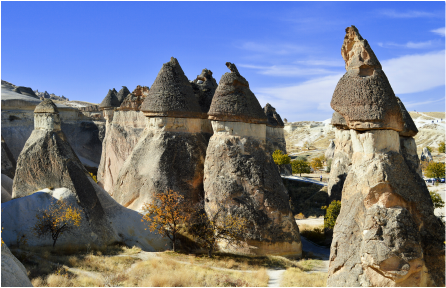 A tour of Turkey guides you through the most unforgettable sights without all of the detail and planning. This is the way to see this diverse crossroads between Europe and Asia. This 9 day escorted tour bursts with highlights, including Ephesus, Troy, and Topkapi Palace. All the while, you are assured of a warm welcome and fantastic hospitality. Gifted with natural wonders like the moonscape of Göreme and the white terraces of Pamukkale, Turkey is blessed with a treasure chest of remains from bygone empires and lost civilizations. Not surprising, ancient Ephesus stands out as Turkey's finest gem.